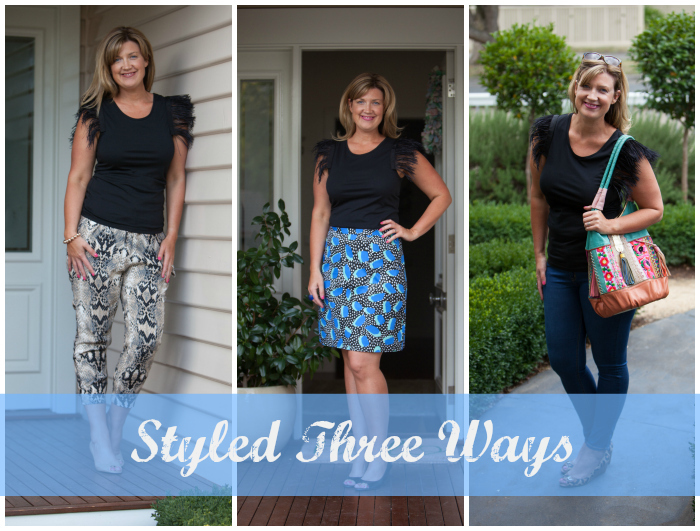 In today’s edition of styled three ways, I’m featuring a top I successfully styled stalked over many months: The Collection Feather Sleeved Tee, $79.95 from Seed Heritage. I’m always on the look out for block coloured tops that work with the many prints in my wardrobe. The divine feather detail in this one immediately caught my eye. 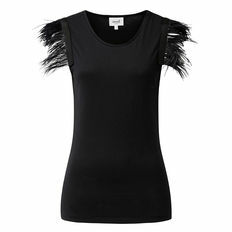 Upon closer inspection, I also saw the feathers are also detachable (thanks to press studs), making this top even more versatile, not to mention easier to wash. The first time I tried it on (sometime last Spring) I loved it but baulked at the price. Eighty bucks for a t-shirt is up there in my book. But then I kept thinking about it and how versatile it would be, particularly with printed skirts and pants over summer. Of course after that, I couldn’t find it in store in my size anywhere. It was also sold out online. Then I spied it in another drop, just before Christmas (during a storewide sale – even better) and I was ALL. OVER. IT. Just last week, I saw this top again in store and found that it also had been restocked online (in sizes XS to L) in both black and white so I thought it was a good time to tell you all about it. And to style it three ways. I chose the black as it works best with my wardrobe but I also love the simplicity of the white, especially with white skinny jeans/pants/denim and either tan or black accessories. First up, I’ve styled this gorgeous tee with my newest pair of printed pants. I love how the textural element of the tee works with the python print (birds and reptiles – it’s all happening). If you’re a curvy girl like me and not sure about printed pants being the focus of your outfit (like I am sometimes), this top balances this out and creates a focal point up top. Above, I’m wearing The Collection Feather Sleeved Tee, $79.95 from Seed Heritage, Snake Printed Pants (in size 12) from Witchery; much loved wedges from Nine West from several years ago (similar here); Rose Gold bracelet from Birdsnest. Next up, I’ve styled this tee with a printed skirt. The black or the white version would work with this skirt but I love the black with this print as it dresses up the skirt and again, creates some visual interest up top. Above, I’m wearing The Collection Feather Sleeved Tee, $79.95 from Seed Heritage; Deep Search A-Line Mini from Gorman (size 14 – the size 12 also fitted but sat much higher on my hips); much loved wedges from Nine West from several years ago (similar here); cobalt blue resin ring from a market. The final outfit is a more casual look incorporating jeans, leopard print and a statement bag. 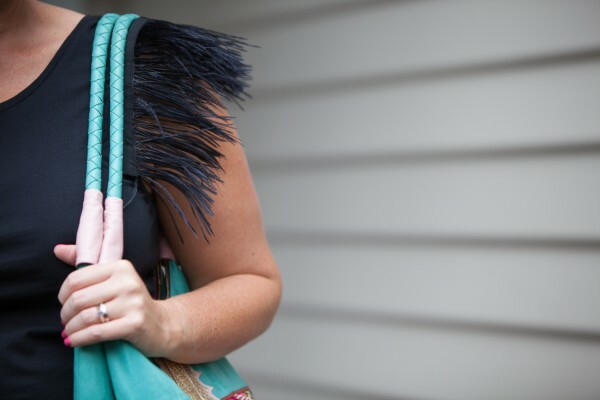 The textural detail of the top is picked up with the tassel on the bag adding some interest to the whole outfit. Above, I’m wearing The Collection Feather Sleeved Tee, $79.95 from Seed Heritage; Mid Rise Crop Jeggings from Country Road; bag from Toko Emporium in Bali (details in my Where to Shop in Bali post); Wedges and Sunnies from Coach, both bought in the US last year. In terms of sizes, I’m wearing a size Medium for a more fitted look (and because I was planning to tuck it in and didn’t want additional bulk) but I actually think the Large would have been fine as well. Just something to bear in mind if you’re between sizes. Have you seen this tee in store? How would you style it? What’s your pick of the above?